Home → Trash Bags (Liners) → Pet Pick Ups, Biopolymer, ASTM D6400 Composting Standards, 000075-Wicket, 2,250 bags per case, sold as one case. Using a state-of-the-art biopolymer, our latest bag meets all ASTM D6400 composting standards. Each bag measures a generous 9??? x 13??? and is 1 mil in thickness. With 75 bags per refill wicket, purchasing a case provides 33% more bags than a case of our standard recycled and limestone wickets (That?? ?s 2,250 bags in one case!). Pet Pick-Ups brand dispensers can hold up to 3 wickets. 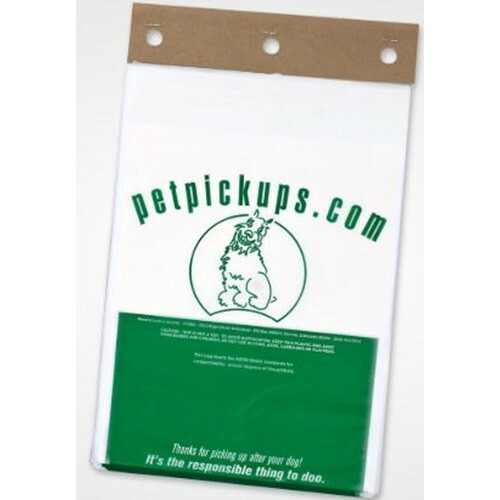 Disclaimer: With regard to the Pet Pick-Ups Bags That Meet the ASTM D6400 Standards, we cannot warrant that our products meet each and every rule and standard of varying governmental entities. Regarding compostable products, please note that appropriate commercial compost facilities may not exist in your area. Please check with your local city and government for a list of compost facilities near you.